Recently I’ve mentioned a tract named Quaacoson (or Quaacosan) Ridge in a couple of articles, one about roofed graves, and one about local quiacason house sites. 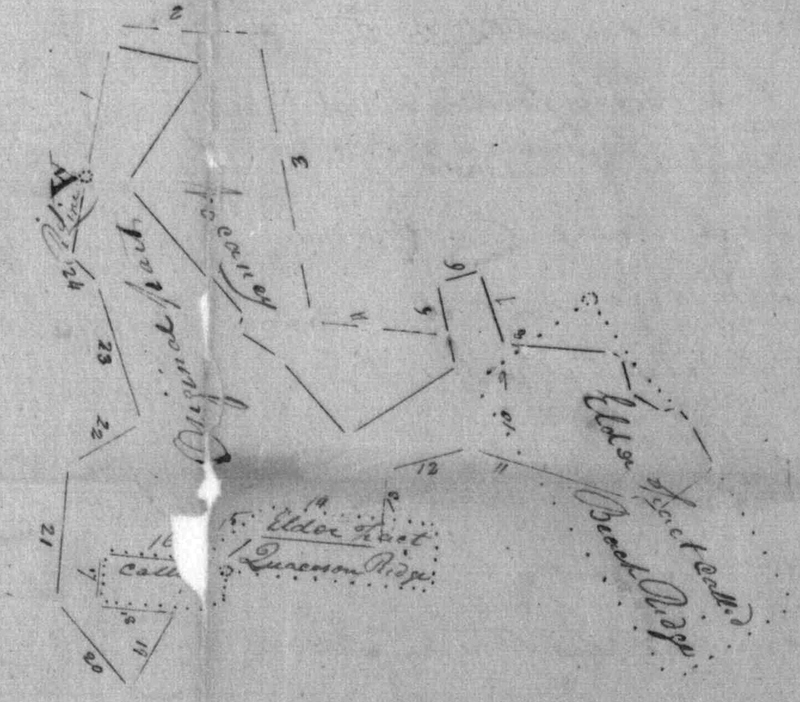 This particular tract consisted of 39 acres, and was surveyed for Isaac Mitchell on May 20, 1758, and patented to him on the same day. Previously he had acquired the 170-acre tract Hogg Yard, and would later acquire a 100-acre tract named Beach Ridge; all three were located in Worcester County. The tract was named after a geographical feature known as Quaacoson Ridge, and its first bounder stood near the southern end of the ridge. 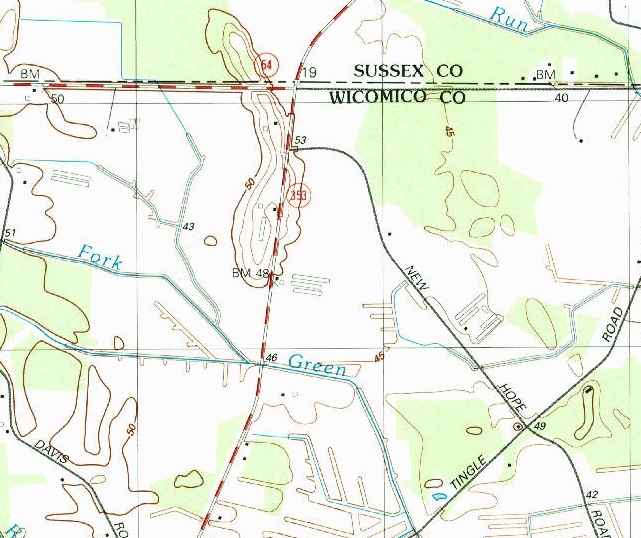 A casual reading of other surveys associated with Isaac Mitchell, and then other families in the general neighborhood, including Wests and Whaleys, told me that the site is located in northeastern Wicomico County, relatively close to the state line. But there are quite a few points of high elevation in this area, and however well the name Quaacoson Ridge might have been known at one time, it doesn’t seem to have made it onto any maps. Fortunately, a great deal of land in the neighborhood was patented to James Whaley in February 1850, and Quaacoson Ridge (the tract) turns up in these records. Even more fortunately, one tract in particular — West Level, which included land formerly surveyed for Henry Spears in 1770 — bordered the state line, making it relatively easy to place it and the adjoining tracts, including Quaacoson Ridge, on a modern map. West Level, patented to James Whaley in 1850, incorporated elder tracts Spears Venture, Addition to Spears Venture, and portions of Quaacoson Ridge and Beach Ridge. The following map was created with Plat Plotter, a free, fun, and very useful app that anyone can use to plot property boundaries. This is by no means exact, but it’s accurate enough for our purposes, i.e., locating the ridge for which the tract was named. Approximate location of West Level and Quaacoson Ridge, plotted with Plat Plotter. It would seem that the white oak which served as the first bounder of the tract stood on the northeast side of the waterway known as the South Fork Green Run (a curious name; South Fork of Green Run might be more accurate), but considering the likely margin of error, it’s not especially important which side of the branch the tree stood on. It’s obvious that it stood quite close to it, probably at the water’s edge. Although this point might not seem to be at the south end of a ridge, it does lie to the southwest of an area of slightly higher elevation, which would have been much more significant during the 1750s, when the land would have been much swampier. 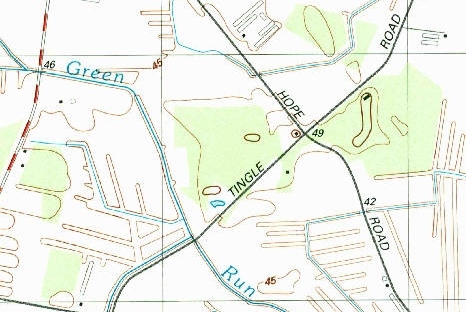 This feature, encompassing the intersection of Tingle Road and New Hope Road, is the most obvious candidate for the ridge due to its proximity and the fact that the tract includes a significant portion of it. Let’s call this feature Candidate A. Candidate A. U.S. Geological Survey, 1992. However, we must consider the possibility that the ridge is actually located a bit further away. After all, “near” is a very subjective term, and “near” in the context of a swampy forest in the 1750s might allow for a greater distance between the tree and the south end of the ridge than a modern researcher might assume. As it happens, the first bounder is, indeed, “near” — roughly 2,500 feet from — the south end of a much more prominent geographical feature which certainly seems very ridge-like. If this feature, which we’ll call Candidate B, was known as Quaacoson Ridge in the 1750s, one can see how a surveyor, lacking other landmarks, might reasonably have described the first bounder as lying near it (though why a tract would have been named after a ridge it didn’t actually touch is a mystery to me). One problem with this possibility is that other tracts associated with the feature in question, such as West’s Luck (which overlaps it), make no mention of Quaacoson Ridge. But they don’t mention any other ridge, either. Since West’s Luck bordered the state line and was surveyed in 1817, the surveyor might have felt that there was no reason to mention any other landmarks. Older tracts might include helpful references; further research is needed. Candidate B, spanning the state line. U.S. Geological Survey, 1992. “Quackinson” is almost certainly a corruption of Quaacoson; Quackinson isn’t a local surname, and I can’t think of any other reason for such a name to appear in the neighborhood in question. The location of this school is a bit unclear. Two nearby schools appear on the 1877 Lake, Griffing, and Stephenson Atlas, unhelpfully labeled School No. 1 and School No. 2, but neither is especially close to the possible Quaacoson Ridge sites, and it’s unclear which, if either, was called Quackinson. 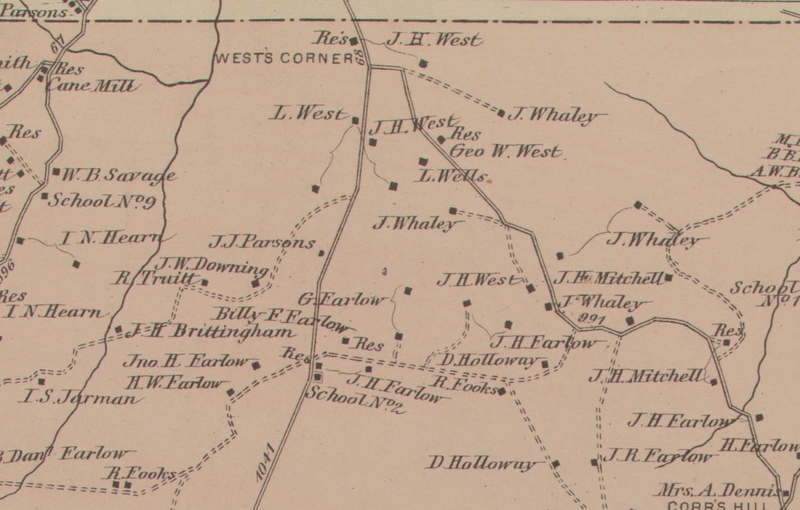 A similar name, Quackison, appears in land records pertaining to Benton H. Whaley, dated 1899; a plat of lands known as Whaley’s Quarter depicts a road from Quackison to Pittsville intersecting with a road from Quackison to Cobb’s Hill. The Quaacoson Ridge neighborhood, 1877. Place-names and specific sites associated with the local Indian tribes are relatively rare. Aside from a handful of settlements (mostly reservations) mentioned in late 17th to mid-18th-century sources, we don’t know of all that many specific places that were important to them. We know even less about Indian activities in this particular neighborhood, or in the neighborhood of the Pocomoke Swamp in general. Like us, Indians used relatively permanent routes to travel from one place to another. Locating such sites can help us to identify the routes used to get to them. Was there a path leading to Quaacoson Ridge? Could it be the basis of a modern road? Or — perhaps more likely — was the ridge reached by water? Determining the approximate location of Quaacoson Ridge contributes to our understanding of local Indian mortuary customs (or at least it raises more questions for us to attempt to answer). The site is far from any known Indian settlement, in one of the last neighborhoods to be developed by Europeans. Why? Did the local tribes always build quiacason houses on the outskirts of their societies, unlike others who are known to have built them in or near their villages? Or did the choice of location reflect a desire to conceal quiacason houses from the colonists, who had been known to damage or rob them on more than one occasion? The location of the ridge could also shed light on the origins of the local roofed grave custom. 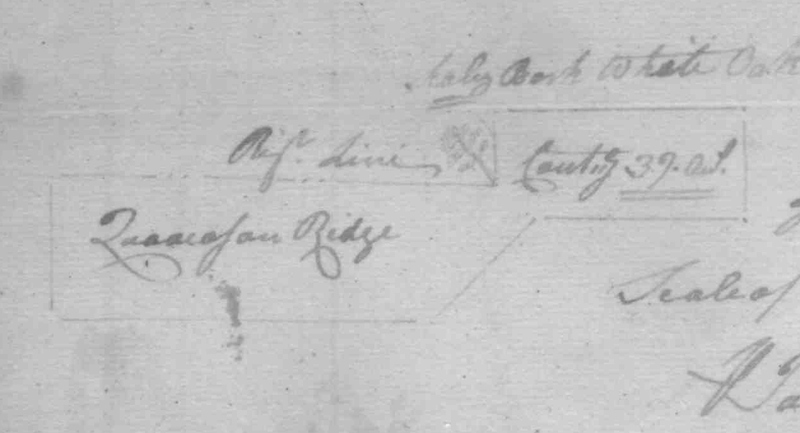 If Candidate B is Quaacoson Ridge, then it’s very likely that the ancestors or close relatives of John C. West (1814 – 1858), who was buried under a roofed grave near Trap Pond, lived on a ridge associated with Indian mortuary houses. That wouldn’t prove anything, but it would be very interesting. Even if Candidate A is the correct feature, it’s still close enough to the Bethel Church cemetery, as well as some of the oldest local West lands, to be related to the roofed grave custom.